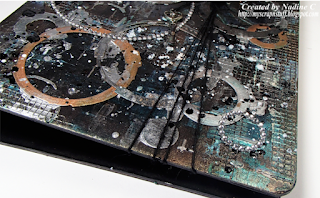 I am absolutely in love with this project from Nadine Carlier. 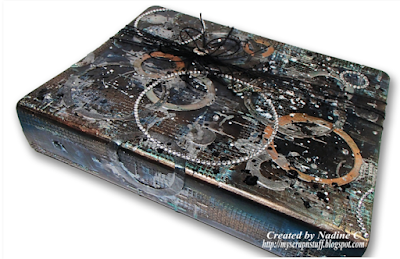 Nadine used my 3 Ring Binder and Robo Ring dies to create this grungy, blingy binder. She also used the newest Delicata ink colors from Imagine Crafts, my most favorite metallic ink pads out there. What a fantastic and creative idea. I love it too, Seth! What a fun share Seth. Nadine I love your binder. 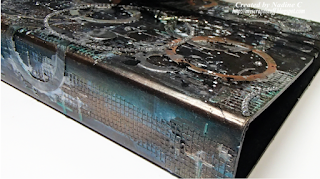 The mix of grunge and bling is perfection. The texture is yummy. Love it so much! Nothing could be better than grunge and bling!